In a large pot, cover the potatoes with water. Bring to a boil, salt the water and cook until tender, 8-10 minutes; drain. In a large bowl, whisk the lemon juice, 3 tablespoons EVOO, vinegar, mustard and sugar; season with salt and pepper. Toss with the drained potatoes, celery, shallots and tarragon; season. Season the fish. Place the ground almonds on a plate. In a shallow bowl, whisk the eggs. In a large nonstick skillet, heat the remaining 1 tablespoon EVOO, one turn of the pan, over medium. Melt the butter in the EVOO. When the foam subsides, coat the fish in the egg, then dredge in the almonds. Cook until the fish is browned and opaque in the center, about 3 minutes per side. Divide the lettuce among plates; top with the fish. 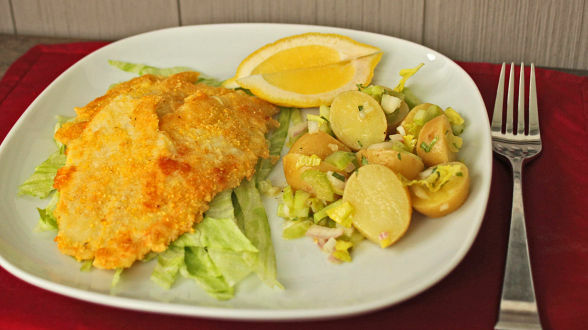 Serve with potato salad and lemon wedges. In Recipes-list.com we have selected the most viewed recipes from category - uncategorized . Enjoy the best recipes specially selected for you! Gluten-Free Fish Fry with Potato Salad is the right choice that will satisfy all your claims.